FREE! DON’T MISS THE ROMANTIC HOLIDAY STORY THAT CONNECTS ALIENATED AND INVADED. Cara and Aelyx only have one day to spend together before he returns to earth and she travels to Aelyx’s home planet, L’eihr. Homesick and worried about the upcoming year apart, Cara is desperate to make these final hours count. Worst of all, Cara is missing Christmas, stuck on board an alien spaceship. When Aelyx learns that Cara is forgoing her favorite holiday, he tries to recreate Christmas in space by researching traditional earth customs…but a few things get lost in translation. 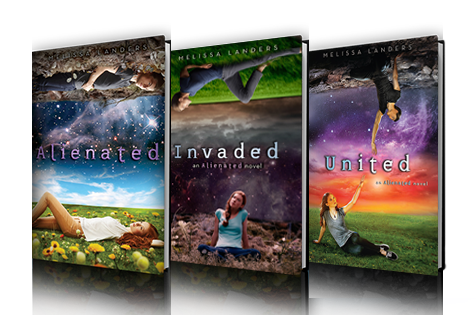 Includes bonus chapters from ALIENATED and a sneak peek at the sequel, INVADED. Amazon | B&N | iBooks | Goodreads | Book Depot | Indigo | Indie Bound | BAM! In the thrilling conclusion to the Alienated series, Cara and Aelyx must unite their people against an ancient species that threatens to destroy them all. The treaty between Earth and L’eihr has awoken an ancient force that threatens to destroy them all. The Aribol, mysterious guardians charged with maintaining interstellar peace, deem the alliance a threat to the galaxy. They order the separation of both races, decreeing humans and L’eihrs must return to their own planets within the month or face extinction. In fact, they already have agents in place on Earth, ready to begin. Amazon | B&N | iBooks | Goodreads | Book Depot| Indigo | Indie Bound | BAM! Amazon |B&N | iBooks | Goodreads | Book Depot| Indigo | Indie Bound | BAM!